UGGS that she wore maybe twice when she was One year old. Well I saw they had the Nordstrom sticker and they were in the original box. My initial thought was list them online for a quick 20 to 30 bucks but something told me to look up the return policy for Nordstrom. 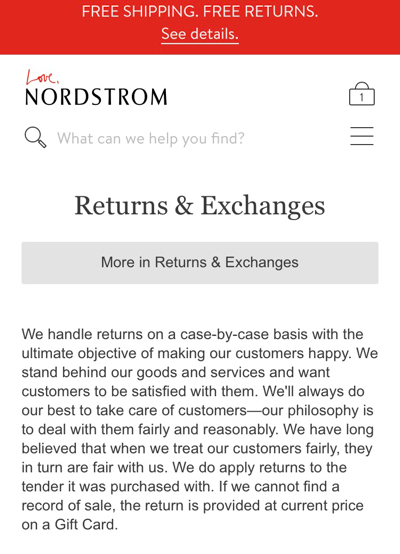 What I learned from researching their website was that they have no return policy and each return is based on a case by case basis! So I immediately deleted my listing for 20.00 online and decided to try and return the uggs for an exchange of the same ones or even a store credit. I mean these shoes were like new and my daughter grew soooo fast that they only fit her for a short time! Well I get to the store and get to the counter and explained why I wanted to return them and the lady who was super polite no questions asked processed my return onto a gift card! That's right ladies and gentlemen I got my full credit for what I paid onto a gift card. I seriously can not believe how smooth this transaction was and am soooooo thankful because I really want to replace the UGGS with something she can use now that she is 3! I encourage looking up return policies and getting the most for your money. I know from now on I will do my homework on return policies so that my hard earned dollar doesn't go to waste.